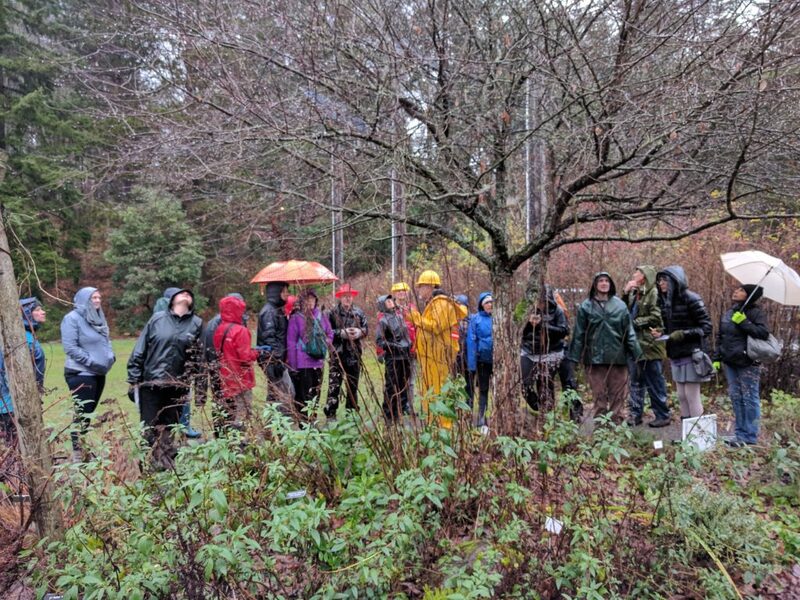 Dedicated Stewards practice winter twig identification in the cold rain. As a steward, identifying and understanding the growth habits of woody plants (trees, shrubs and vines) is tremendously valuable during our winter planting season. We joined WNPS’ Clay Antieau in a walk and talk tour to learn winter growth habits and the main diagnostic concepts, procedures, tools and resources used in woody twig plant identification. Who can say no to sharing brunch with other Forest Stewards over an outreach and engagement discussion? At this workshop, we shared general community outreach knowledge and additional information on how to engage and recruit high school and college groups for community restoration events. Safety, age-appropriate tasks, and education resources were discussed. Breakfast burritos were a hit! Steward Field Trip on Vashon Island! The 2nd annual Steward Field Trip to Vashon Island was a success. We carpooled to Vashon, and spent the day touring, socializing and picnicking. David Warren of Vashon Forest Stewards guided us through restoration sites at Agren Park and a private property. These sites are quite different in history and management compared to Seattle forests; it was a worthwhile opportunity to compare and learn. Look for the 2018 Field Trip location to be posted soon. Managing and controlling invasive vegetation in our parks and natural areas requires knowing which tactic to employ, and perhaps patience and vigilance. Physical, mechanical, cultural, and biological tactics keep populations at tolerable levels. But what do you do, and when do you do it? This field training led by steward and contractor Steve Richmond of GardenCycles provided activities and discussion for invasive plant identification practice, life cycle considerations, monitoring techniques, preventative maintenance, and an overview of contractor treatments. Your Chance to Become a Steward! If you’re interested in the opportunity to become a Master Native Plant Steward, then you should CLICK HERE for more details and an application to apply. The program will begin this March, and the deadline to apply is February 11th!